In his powerful keynote presentation, Peter converts Olympic Gold into corporate wisdom. With a live demonstration on the pommel horse, artfully blended into his speech, Peter uses the ROV principles to vividly describe requirements for a perfect 10 in business and in life. Audiences gain fresh perspectives on reaching higher levels of performance, using their creativity to separate them from the competition, and perfecting their needed skills on a daily basis. As Peter says, "If you want to be at your best when it really matters, you've got to be at your best when it doesn’t matter." Humor, relevance to his audience, high energy, drama and standing ovations are all characteristic of this presentation. Gymnastics, while a team sport, is based entirely on a collection of individual performances for it's outcome. At the Olympic Games, while he was competing with his teammates, Peter was simultaneously competing against them for individual medals. So how did these individual athletes work together on a daily basis for the benefit of the team? Using the ROV principles, Peter answers this important question, describing the tools you and your team can use, every day, to reach the top of your Olympic Podium. One of the reasons gymnastics is the most watched event of the Olympic Games is that the viewer can always expect something new and different from the athletes. Gymnasts are masters at pushing the envelope, as they constantly try to reinvent their athletic art form. Innovation also involves some risk, and Peter shows how ROV: Risk, Originality, and Virtuosity, can become a mandate for constant change in his sport and in your business. In describing how we need to stop playing “catch up” with the competition, Peter says, "A perfect 10 just a few years ago may only score an 8.5 today. If you don't innovate, you’ll be left behind very quickly!" Peter continues to contribute to the Olympic movement today. He is the Chairman of the Board of USA Gymnastics, the national governing body of gymnastics in the United States; has served as the Co-Chairman of the US Olympic Committee Summer Sports Summit, an annual series of workshops designed to prepare America's medal hopefuls to win gold in future Olympics; serves as a USOC Olympic Ambassador, helping to prepare all of America’s athletes on working with the media and to represent the United States with character and respect. 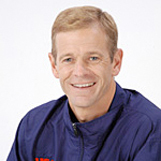 For many years, Peter has also worked as the gymnastics commentator for CBS Sports and ESPN. He continues to work as a journalist, broadcaster, and corporate spokesperson at each summer Olympics. Peter has served on the President's Council on Physical Fitness, Sports & Nutrition; serves as the Vice Chair of the California Governor’s Council on Physical Fitness & Sports; is the Vice President of the Southern California Committee for the Olympic Games; serves in his hometown as Vice President of the Orange County Youth Sports Foundation; and is Chair of the Los Angeles "Ready, Set, Gold!" Program. Peter is a powerful and entertaining speaker at corporate meetings and trade shows. With over two decades of experience for hundreds of corporations and professional associations, Peter has helped people throughout the country realize and fulfill their own potential. In his inspiring, humorous, and entertaining presentations, Peter discusses the three components of a perfect score in gymnastics - Risk, Originality and Virtuosity (ROV) - and how these principles apply to success in business and life. Peter’s message brings something unique and refreshing to the corporate arena.